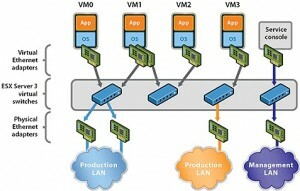 One of the big branches of Virtualization these days is Network Virtualization. We touched earlier on What are different types of Virtualization and skimmed through the topic of Network Virtualization. Network Virtualization is one of the younger branches of virtualization. In this article we will go through and talk about two different types of virtualization technologies, internal virtualization and external virtualization. Lets have a look at both network virtualization solutions and see which one would best suit your needs. Internal Network Virtualization provides network functionality purely based on software. An example of is the network topology used by common virtualization produces such as VMWare server or Microsoft Virtual PC. In these you use existing network in your environment and present it to the virtual machines using a simple bridged or NAT based networking. However Internal Network Virtualization can be much more complex and with the software itself you can provide Virtual Switching, Virtual Networking and even Virtual Firewall solutions. One great big advantage of Internal Network Virtualization is that it is not hardware dependent. Internal Virtual Virtualization has the same advantages to it as any virtualization solution such as storage virtualization does, it is essentially “Network in a Silo” scenario. This type of virtualization is very useful in disaster recovery and business continuity models supported by virtualization. Datacenters and enterprises are now increasingly implementing this type of network virtualization. The diagram above clearly shows Internal Network Virtualization where physical network cards connect to a layer of ESX3 server which hosts the virtual networking split between various virtual machines. External Network Virtualization involves and actual physical device that caters to your network. This type of virtualization has been around for some time now, a typical example of this would be a CISCO networking switch that provides VLAN (virtual LAN) capabilities through its internal CISCO iOS software. An advanced CISCO routing example includes providing automatic QOS and packet analyser service which lets you prioritize network traffic as well as diagnose network related problems. The advantage of having an external virtualization solution is that it has a very small footprint due to its “dedicated” nature, its resources are not shared by other tasks and burdens of your virtualization infrastructure. What type of network virtualization does your virtualization infrastructure use and what are the products you use to implement it, do share your thoughts and comments with us.